At All County Health Care, we thrive on the value of service we give to our patients and their families. 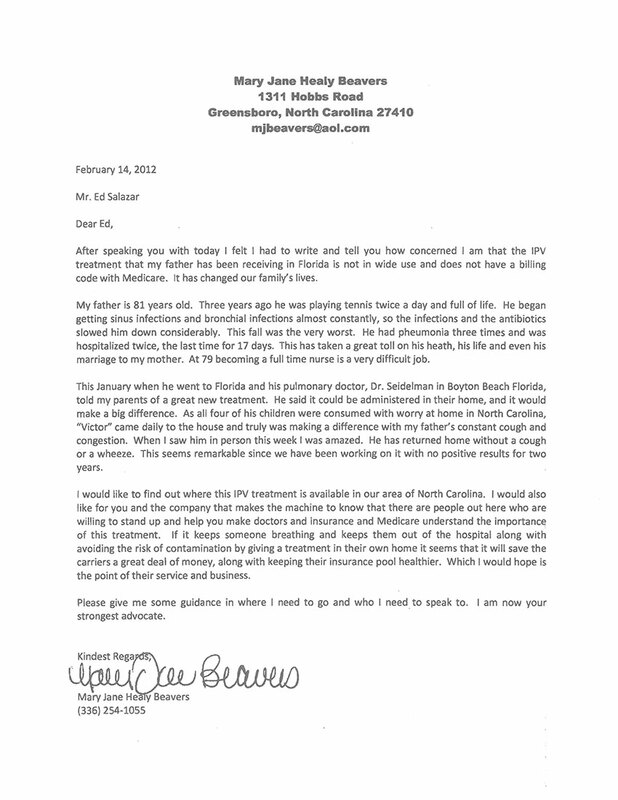 Here are a few testimonials from family members and patients that have been treated by All County Health Care. At this time I am a patient receiving care from two of All County Health Care’s professionals named Barbara M. and Andrea M. I have to say that both of them are so very polite, caring, professional and knowledgeable about home health care. These kind ladies took their time to answer all my questions and to make sure I was comfortable in all aspects of the care plan. I must say that I will highly recommend their services to anyone that may need home health care, All County Health Care truly gives the best care for their patients. Thanks to our wonderful IPV therapy nurse, MARIBEL CASTELLANO, my Mom has been doing great. I wish we have known about this therapy years ago. It would have avoided all the suffering and hospital visits. Maribel is awesome. My Mom, Ana, looks forward to her therapy. This treatment helps to keep her lungs clear of all mucus and congestion. My Mom gets it twice a week with three different medications. Thanks for the great treatment. 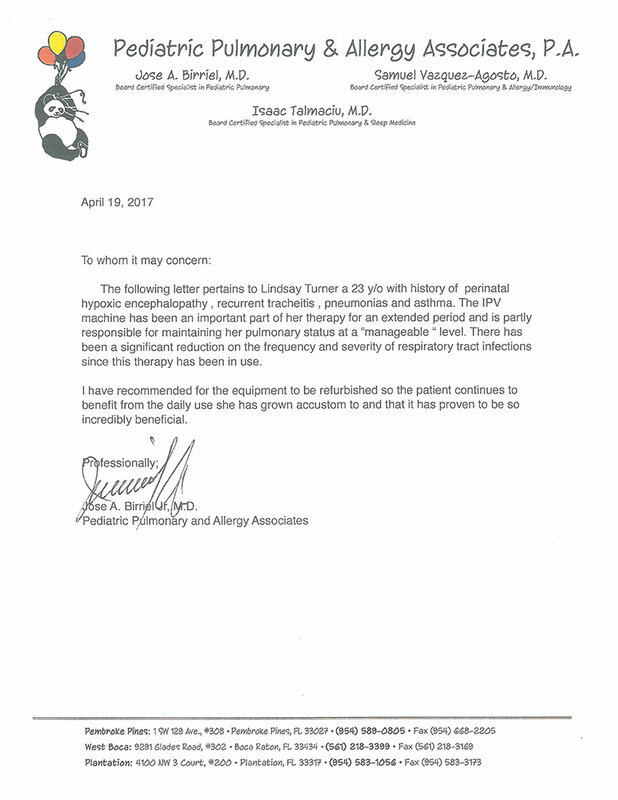 I was not aware of such treatments being available that would help me even farther to improve my breathing – and then I was given IPV! THANK YOU! It is slowly IMPROVING MY BREATHING and I AM SO GRATEFUL!!! All County Health Care provided wound survivor for my wife wounds for almost 3 months must of the services were provided by Chandra who was excellent patient a thorough and very professional they were consistently on time for all visits. We have no hesitancy in recommending their services. All County Health Care has the most and caring professionals. The physical therapist who took care of my wife, Janice, was friendly, patient and great at her job. I highly recommend All County Health Care to anyone in need. Our father was in a hit and run accident on September 13, 2017 with most of the blunt force trauma directed to the chest. He has been transferred from facility to facility, most, which had given up on him and labeled him vent dependent. 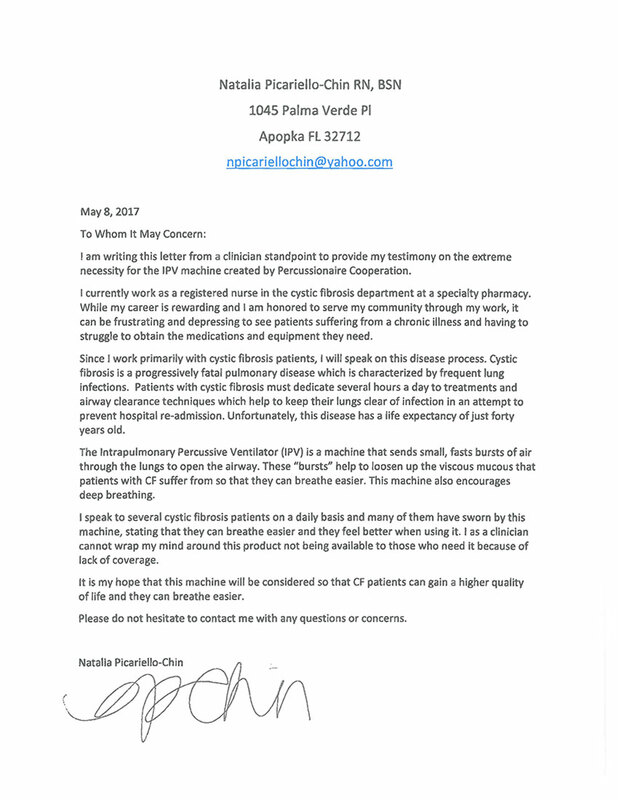 This last round of gram negative pneumonia sent him from the Avante Rehab facility to the Ocala Hospital where they had mentioned to us that an IPV (flow ventilation™) would benefit him greatly. To our disappointment, Medicare denied the claim. On January 23, 2018 dad had his first therapy treatment utilizing the IVP-1C® in conjunction with the Phasitron®. We could not believe that we were able to see an improvement after one treatment (even with MRSA pneumonia)! He had more color and was more alert. He improved with each therapy treatment received, so much that on February 5, 2018 he was weaned off ventilator & trach was pulled. Everyone agrees that the main reason this occurred was due to the innovated technology Percussionaire has developed. After seeing the efficacy of this therapy, we feel that we need to be an advocate for Percussionaire in hopes that Medicare will start to cover these treatments. Imagine how many other patients in the same situation that our father is in that could benefit from this treatment. The potential to decrease hospitalization stays and give these patients their lives back is tremendous. As an ICU/ER RN I was amazed. We cannot thank you enough for helping dad get on the road to recovery and home sometime soon. We look forward to celebrating our parents 50th Wedding Anniversary, all thanks to Percussionaire and their IVP! I had spine surgery almost 4 months ago, my spine was about to collapse, extremly painful. Since I was discharge home ALL COUNTY HEALTH CARE INC. provided me right away all the care and support I needed. Alexander, I beleive he is like a doctor-nurse came every week until I was discharge last week, can’t say enough of how much he care in every way to see all I needed was done, did researches of things that came across with all the pain I was suffering, very human and a great profesional way in taking good care of all my needs. Never missed a week to stop by see how I was doing. Excellent is ALL I can say. On the other hand, Vernet, the therapist still comes twice a week a makes sure that under the condition I was after surgery, very poor movement on my side was brought me up to gain back on my foot, does care if I progress and even does research because after almost 10 hours of surgery I could hardly move, be on my foot, Vernet has brought me back moving. I know I still have a few more months but I feel he is an excellent therapist and has helped me a lot. All County Health Care, gave me EXCELLENT service and most of all they care about my well-being, can’t thank enough and recommend them. I will miss them but as they did give me lots of excellent care. Highly recommend this institution. I was in need to recover and they were there for me 100% Thank you Alexander and Vernet and off course people who are behind making sure we as patients are well taken care of. The IPV therapy my Mom has been getting for the last 6 months has been God sent. Our therapist is Alex Porres. He has been wonderful along with his assistance Maribel. This treatment has avoided many visits to the emergency room for my 92 years old Mom. I wish we had known about it many years ago. This would have prevented many challenging and hard moments my beautiful Mom has suffered and gone through. This therapy helps to keep her lungs clear of all mucus and congestion. My Mom gets it twice a week with three different medications. Thanks for the great treatment. My experience with All County Health Care has been very good. The nurse who came daily was excellent and always very caring. She was well informed and very competent. The nursing supervisor who came was also excellent. I felt very comfortable with my care and I would recommend this company to others. In Regards to nurse Chadam, I wanted to say she’s an excellent nurse, very proficient, professional, and caring. She’s a very caring nurse, she is always on time. Assisted me on getting well, made me feel confident, in I can do this, she can do this, we can do this together. I just wanted to let management know, she is truly a godsend. And without her, I don’t know if I could have done this. I have been blessed to have her on my team. Thank you from the bottom of my heart. I am very pleased with the services I received from All County Health Care particularly my wound care. My nurse has been very caring and courteous as she worked with me for along time she was always on time and very encouraging. The conversation between the wound care doctor and All County Health Care was excellent! Thank you I had a rather pleasant experience. It was a pleasure to have your staff in our home treating my mother. Her physician requested Intrapulmonary Percussive Ventilator (IPV) therapy to help with her distressed breathing. The IPV was a tremendous help alleviating my mother’s breathing problems. Way more than kind words… the IPV therapy was just one thing that you did for us… at a time of deep need my family had the benefit of your empathy and professionalism… the reality of being a care taker is overwhelming… in my mother’s memory… may god bless you for helping us.